Vintage Apple iPod Classic 2nd Gen 10GB, A1019, Great Working Condition! Condition is Used. iPodi s fu ll y functionala nd w or ks p er fe ct. Ba tt er y ho ld s ch ar ge ! Typicall it e sc ra tc he s ar ou nd b od y fr om l it e us e. iPod only, no cables. 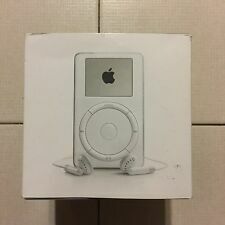 This is a White Apple iPod Classic 3rd Generation 15gb. This is a special cable, that was only used with the 3rd generation iPods (sold in the years 2003-2004). I do not have any cables or accessories to include, you get an iPod only. Apple iPod Classic 10gb Bundle. 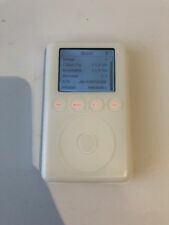 White 10gb iPod - Model A1040. All functions work. 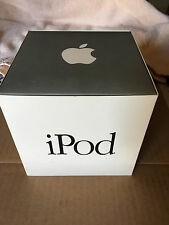 2003 dated 10gb iPod with plenty of original extras. Bundle includes -. iPod charging dock, with spare cover. Black case, with Apple logo - vgc, made for this iPod. 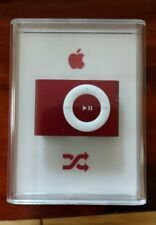 Apple iPod Classic 2nd Generation (10 GB) in rare to findNEW condition. This is a White Apple iPod Classic 2nd Generation 10gb. IMPORTANT: This iPod uses a firewire-400-->firewire-400 cable (not included). Your computer will need to have a firewire-400 port in order to use the iPod. This is a used Ipod, 2nd Generation Model #A1019. The battery is still very good for its age, and the unit still has music from the previous owner which I'm unable to factory reset due to no devices in my house that has a firewire. 10GB version. 2nd Gen iPod. iPod only, No wire included. Apple iPod Classic 3rd Gen 15GB White with TONS OF ACCESSORIES! MUST SEE! The hard drive has been reformatted to provide a clean slate for the lucky new owner. Tested and work great. Not tested. iTrip adapter (used to listen to music through radio) CD. All sizes are approximate. Apple iPod M9460LL.15GB 3rd Generation.White. All tested - All good. iPod only. Rare item Good condition. Great sound. Works great. IPod (Dock Connector) models are referred to as third-generation iPod models. iPod (Dock Connector). iPod (dock connector) models have a dock connector on the bottom. A1040: 2003-09. IPod classic 2nd Generation. Storage Capacity. Up to 10 Hours. Product Information. Product Identifiers. Exterior Color. FireWire, USB 2.0. Screen Size. IPod only. See pictures. Very Good Condition. Normal wear on front and back. See all pictures. Very good battery. 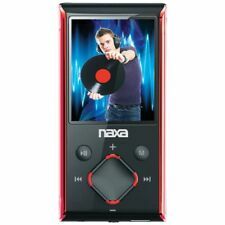 Plays MP3's, movies, and photos. This is an authentic OEM iPod headphone jack and compatible with the 10GB, 15GB, and 20GB model iPod 3rd Generation (A1040). Up for sale is (1) used Headphone Jack for 3rd Generation Apple iPod [A1040]. For sale is my used Ipod Classic. This was the first model Ipod available for Windows and PC. IPOD CLASSIC. 2ND GENERATION. Black Case - This case is missing the belt clip. Original Box, with complete outer box. 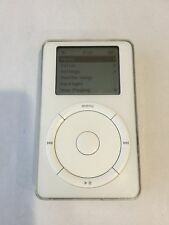 Apple iPod classic 3rd Generation White (10 GB). Condition is Used. Item is in functional condition but has cosmetic flaws. It plays music and all buttons work. The battery holds a charge but I haven't tested how long it will last for so there is no guarantee on that. Item has scratches on the front and back, and there is a dent on the back metal casing. Shipped with USPS First Class Package.